Stories of immigrants pursuing the so-called American dream and earning a fortune grace the annals of libraries, but rags-to-riches tales are actually rare, a reality driven home in James Rouman’s vivid depiction of Rejep Etaj, a downtrodden Albanian who enters the US illegally. Like any aspiring citizen on foreign soil, Rejep believes that with the right connections and the right job, he will somehow succeed. Without a green card, however, his prospects for a contented life in this country are dismal at best. Always looking over his shoulder for a potential informer and dreading the intrusion of immigration officials, Rejep bonds with his Greek-American girlfriend, Eudoxia, hoping they will someday marry against the wishes of her domineering mother. As a maintenance worker in the hallways of a ritzy condominium known as Capital Towers, in Connecticut, he advances himself through strategic contacts. Meanwhile, his illegal status haunts him throughout this perceptive story of a man whose only crime is the desire to remain in the US. Rejep experiences frustration in his routine interactions and deals with the situation like the majority in his position. He keeps his illegal status a secret for as long as he can in an environment that threatens to expose him daily. This realistic look at Rejep’s mental torment is an eye-opener. Insensitive people subject him to belligerent ostracizing and treat him as a foreign entity with disreputable, if not dangerous, intentions. A native of Tomahawk, Wisconsin, James Rouman is an anesthesiologist. He served in the navy during World War II and practiced medicine in Connecticut. 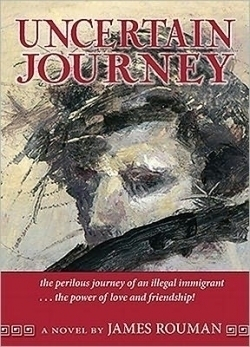 Uncertain Journey is his second novel. An illegal immigrant is a human being, not a statistic, and this is the most important underlying message. The work of this polished author will elicit a wide range of emotion from sympathy to skepticism. Articulate and insightful, his descriptions bring to dramatic life an individual who simply wants to escape the bad conditions in his homeland for a better existence.